Right, this is going to have to be a quick blog because I’ve very nearly almost finished the first draft of my new book, The Silvergreen Sea, and I need to get back to it just as soon as I can to write the final scenes. Never mind that I already know I’m going to have to do loads of re-writes, the point is, it’s a first draft, and I want to get the damn thing finished. One of the troublesome things about writing is that characters seldom do exactly what they’re told. This probably sounds ridiculous to a non-writer: after all, I create these people, I decide on their past and on their future, what they look like, what they do, what they say, what they think, whether they live or they die. I’m their all-powerful God. Except, it’s not quite as simple as that. As soon as I’ve spun a character into existence, they start making their own decisions, clamouring for more attention, getting up to things behind my back. With this book (unlike the last), I’ve managed to bully my major characters into (mostly) behaving well, but then the minor ones have caused all kinds of trouble. One grabbed a knife and refused to play well with others. Another caught a horrible disease. Two more started a clandestine affair. It’s all very annoying. I can console myself with the thought that, if they’re leaping to life from the page for me, then with any luck they’ll similarly leap to life for the reader. Better to have troublesome characters than boring ones. And I suppose real human beings have never behaved quite as God intended, so if it’s a problem, it’s one I share with the Almighty. Now, back to the literary coal-face, hoping my characters won’t have started any fires while I’ve been looking the other way. It’s the middle of cold, grey, January, I’m firmly back in the work trench (reached 80,000 words on the first draft of The Silvergreen Sea yesterday and celebrated with a cup of tea), and the Christmas board game season already feels a long time ago. Now, I love board games, although I sometimes struggle to find the time and willing participants. Or the patience to deal with some of my slower friends, who feel the need to over-analyse every possible combination of moves and dice rolls (if you’re reading this, you know who you are). Part of the problem is that, for too many people, board games are soured by childhood recollections: repeated losses at chess, over-competitive older siblings, blazing rows over the Monopoly board. It’s a sad irony that, while board games have improved tremendously over the last few decades and there are now available countless different options suitable for every taste, the most popular games – and the ones most people think of when ‘board games’ are mentioned – remain those of yesteryear. Monopoly. Scrabble. Risk. Cluedo. Trivial Pursuit. What all these games have in common, besides the fact that they’ve been around for decades, is that they’re utterly terrible. What makes them so very bad? Well, it varies. In the case of Trivial Pursuit, it’s the awful quality of the questions – trust me, as a former question-writing professional, I know of what I speak, and there’s no way those questions would pass muster on The Weakest Link. Oh, and the endless bloody dice-rolling. With Cluedo, it’s the fact that every single time, you guess the weapon and murderer quickly, then spend ages trooping across the board to get to the next room, only to get pulled into the %$£&ing billiards room just when you’re almost there. Scrabble – at least when I play it – degenerates into people trying to block off the triple word score and arguments over whether ‘xi’ and ‘qi’ are permissable words (they TOTALLY are). Monopoly and Risk both have that you-get-eliminated-early-then-the-game-goes-on-forever quality. Yet despite their terribleness, these games continue stumbling on like zombies that just won’t die, spawning endless special editions themed as Sherlock or Star Wars or – appropriately – The Walking Dead. What games, then, are better? Well, one game I’ve played a lot this season, and which I unhesitatingly recommend to anyone, however scarred by that round of Diplomacy (‘The game of interminable backstabbing!’), is Ticket to Ride. It’s fun, it’s simple, and you get to build steam trains to Constantinople. It’s a perfect ‘gateway game’ as boardgamegeek.com would put it. As a fantasy writer and reader, however, I always like to check out games based on created worlds. I’ve had some issues with Tolkien-based games in the past, and the game of Game of Thrones sounds a bit too much like Diplomacy for my liking, but I absolutely love the Ankh-Morpork game, hiding my secret identity as Vimes or Vetinari whilst playing cards like Rosie Palms and Death (‘HELLO’). This Christmas I got to try its sequel, the Witches game, which sadly, wasn’t quite so good, not least because you don’t get to be either Granny Weatherwax or Nanny Ogg. The game features a rule – which my husband decried as ‘stupid’ – that, if there’s ever 3 elf tokens on the board at once, everybody immediately loses. This rule didn’t make much sense to me either, and I realised this must be because I hadn’t actually read the appropriate book (‘Lords and Ladies’) – so I did, immediately, and a fantastic read it is too, one of Pratchett’s best imho. And now the elf rule makes sense. 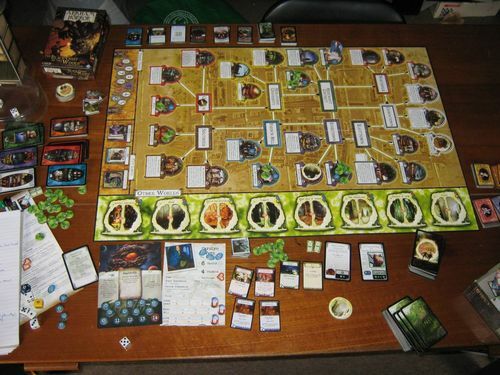 Eldritch beings which cause everybody to lose suddenly are the main feature of another game based on a fantasy world, Arkham Horror. This game is quite immersive in the world of HP Lovecraft, but it’s definitely a whatever-is-the-opposite-of-a-gateway-game. There are Sanity Tokens which look like little brains. You fight monsters and the Doom track advances. Then Azathoth awakens and destroys the world, which means everyone automatically loses. Or you could play against Cthulhu instead, in which case you fight for a couple of rounds and then he devours everyone (this also means you lose). It’s a co-operative game, so inevitably, you all lose together. Supposedly the game does have victory conditions, but I’ve not seen much evidence of them in action. Although I’ve yet to encounter a board game in which there actually isn’t any victory condition, many video games have a ‘Survival Mode’ where you just keep going until you die – and I’m old enough to remember when all video games were like that. I commented at my writers’ group that this is, of course, how it works in real life. ‘Life – the game with no victory condition’ – a very January sort of sentiment. Then one of my writerly friends came up with the more optimistic view that you can define your own life victory conditions, which got me thinking. Maybe one day – if I keep writing, and get lucky with those unseen dice rolls – I’ll be able to play a board game based on a fantasy world I’ve created myself. And If that ain’t a victory condition, I don’t know what is. So, it’s 2015 now, which is officially The Future. Although I think my hoverboard seems to have got lost in the post, sadly. While waiting for it to turn up, I’ve been asking some of my family and friends if they have any new year’s resolutions. Responses have ranged from the straightforward – ‘I’d like to lose another stone’ – to the mysterious – ‘Well, I have my own aims, but they’re not tied to anything as prosaic as what year it is’ – to the minimalist – ‘Survive’. I’ve also seen someone on Twitter with the commendable resolution to ‘continue bumbling along in the same half-arsed fashion as heretofore’. What’s my plan? My main aim is to finish – not just first-draft finish, properly finish – my current work-in-progress, The Silvergreen Sea. How long that will take remains to be seen, so at the moment I don’t have any other writing resolutions. Ideally, I’d get another book done, at least in first-draft form, but if The Silvergreen Sea requires extensive revisions, that might have to wait for 2016. I’ve also been thinking I should really do something that isn’t writing, to keep things varied and get me out of the house: do some voluntary work, and learn something: French or Italian or BSL or piano or algebra. But I haven’t yet quite get my head round what I’ll have time for, or what would be most beneficial. Perhaps my first non-writing resolution should be to work out what non-writing thing I want to resolve to do. Finally, I have not a resolution, but an aim: to try and get myself flying again, so I can get further from home than Kent. I can’t control my back pain, but I can at least try to manage and improve it through exercise and medication, and – I hope – enable myself to do the things most important for me. Like go on holidays to see some friends and family later in the year, so we can compare notes on how all those resolutions are going. I hope everyone achieves what they want to (unless your resolution is ‘achieve annihilation of the human race’) so we can make 2015 the year it all happens. After all, we’re now living in the future.